I was married to Mariëtte, a medical doctor who was renowned for treatment of patients suffering from HIV/Aids. 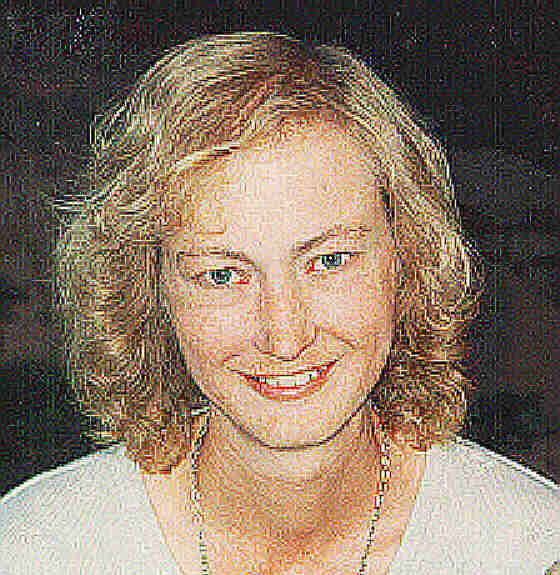 She passed away in early 2017. We have been fortunate to travel frequently. Academics are expected to cooperate with their international peers and this has taken us to a number of interesting places and given us the opportunity to meet many interesting friends. A few of the highlights (in pictures) have been posted on a different page. Our house is shared with a few furry friends. The youngest of these are four dogs. The were part of a litter of seven puppies whose mother died when they were exactly one week old. The owner of the mother told Mariëtte that they were trying to feed the puppies milk, but the puppies were not interested in the milk. Marëtte immediately dispatched a taxi to fetch the litter op puppies and dispatched me to find some puppy formula. The puppies needed to be fed regularly and each drank about a teaspoon of puppy milk at each feeding. This turned out to be a momorable Quartus and Imka (the two Weimaraners), Lexi (the Labrador) and Katernoster and Blanc de Noir (our cats). 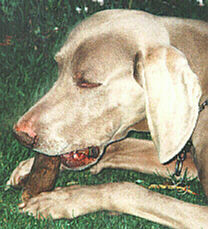 Weimaraners are hunting dogs, originally bred in Weimar. Weimar is a city in southeast Germany that played an important part in German history and was home to Goethe, Schiller and other notable figures. 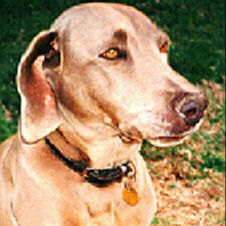 Here Weimaraners were bred by German nobles at the court of Weimar in the nineteenth century. 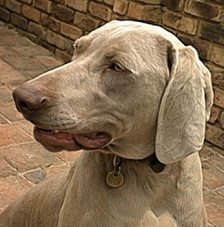 Quartus is named so because he is the fourth Weimaraner we have owned, having arrived at our home about six months after Imka. Imka got her name from a Germanic word for bee - an apt name given her energy (that is, unfortunately, mostly spent on what remains of our garden...). 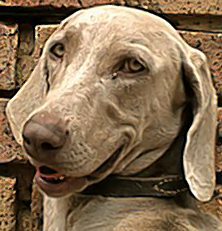 Just one of the many things that make Weimaraners special: when the pups open their eyes, they are blue and eventually turn to amber. When Katernoster was about four weeks old he hitched a ride (as a stowaway) when my brother and his family returned from a holiday at Margate. When he arrived in Johannesburg he had a broken jaw, but - being a wild cat - managed to evade us for a couple of hours before we eventually managed to catch him. Now - a few years later - he is a very happy inhabitant of our house, with a slightly skew jaw to remind him of those early days. And we have a new set of curtains... And, in case you were wondering, Katernoster's name was derived from the German for "male cat" and from the Latin for "our". 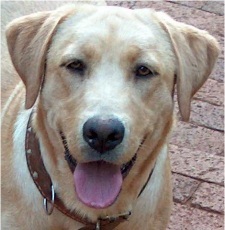 Blanc de Noir was found abandoned when the grass in a veld behind Kalafong Hospital was mowed. At that stage he was at most a few days old - and had to be bottle fed, drop by drop. Strange cat: he loves dogs... (and people!). 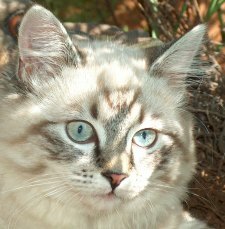 We adopted Lexi after she turned out to be too lively for her previous owners; luckily Imka and, especially, Quartus keep her so busy that being lively is not really a problem for us. Our previous dogs, Hitler and Tasha, were already grown-up dogs when they arrived at our home, names and all. Hitler passed away due to illness at the age of eight in 2000. 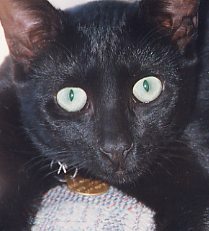 Tasha reached the old age of thirteen, before she died in 2001. The years 2000-2003 were also sad in another regard: Our paths crossed those of politicians and investigative journalists and we got some insight in how they (or at least, some of them) operate. Since the details were beginning to occupy too extensive a portion of my personal page, the details about the politician, the media and the drug trial are now posted on a different page. Fortunately, as time goes by, the realisation that journalists and politicians shouldn't be taken too seriously becomes stronger, and one's attention returns to other, more positive, interests. One of these more pleasurable interests is reading. Our home library consists of about 1000 books. These include novels by our favourite authors such as Charles Dickens, Wilbur Smith and Sydney Sheldon. They also include many books that are probably only of historical interest, such as those detailing programming in PL/1, Fortran and Cobol. And then there are reference books about topics that we find (or found) interesting, as well as quite a few books from bargain basements that we simply couldn't resist.